Kellogg Company (K), together with its subsidiaries, manufactures and markets ready-to-eat cereal and convenience foods. solutions for corporations, institutions, families, and individuals worldwide. Most shareholders do not vote. Reading through 70+ pages of the proxy takes too much time. Your vote will make only a small difference but could be crucial. Below, how I voted and why. I voted with the Board’s recommendations 29% of the time. View Proxy Statement via SEC’s EDGAR system (look for DEF 14A). From the Yahoo Finance profile: Kellogg Company’s ISS Governance QualityScore as of April 1, 2019 is 7. The pillar scores are Audit: 1; Board: 6; Shareholder Rights: 9; Compensation: 1. Corporate governance scores courtesy of Institutional Shareholder Services (ISS). Scores indicate decile rank relative to index or region. A decile score of 1 indicates lower governance risk, while a 10 indicates higher governance risk. We need to pay close attention to Shareholder Rights and the Board. Vote AGAINST Laschinger and Tastet. Kellogg’s Summary Compensation Table (p. 41) shows the highest paid named executive officer (NEO) was Chairman and CEO Steve Cahillane at $10.0M. I’m using Yahoo! Finance to determine market cap ($20.1B) and I define large-cap as $10B, mid-cap as $2-10B, and small-cap as less than $2B. Kellogg is a large-cap company. According to the Equilar Top 25 Executive Compensation Survey 2015, the median CEO compensation at large-cap corporations was $10.3M in 2014. However, Kellogg shares underperformed the S&P 500 over the most recent one, two, and five year time periods, even over 2019 to date. The ratio of the annual total compensation of the CEO to the median of the annual total compensation of all employees was 213:1. Given severe underperformance, I voted against and also voted against members of the compensation committee. I cannot support median pay for such poor performance. Yes, the CEO’s tenure is rather short but pay should be geared to past performance, not simply hopes for the future. I have no reason to believe the auditor engaged in poor accounting practices or has a conflict of interest. Egan-Jones recommends voting against the auditor if they served for seven years. Independence becomes compromised by that time. PricewaterhouseCoopers has served more than seven years. No other issues appear significant. 89% of the S&P 500 have declassified their boards. According to one of our largest shareholders; BlackRock, “Directors should be elected annually to discourage entrenchment and allow shareholders sufficient opportunity to exercise their oversight of the board.” BlackRock voted for shareholder proposals to declassify boards 8 times out of 8 in 2018 as of early August, as did Vanguard. It is important to note, the Board of Kellogg’s does not oppose the proposal. Instead, it takes no position. 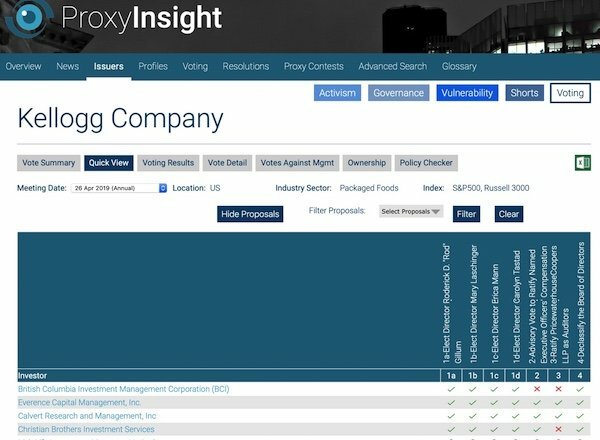 Proxy Insight reported the votes of three funds as I wrote up my recommendations. By now, they may have updated those reporting prior to the AGM. You can look up several funds on our Shareowner Action Handbook, You are sure to find more if you wait until the last day to vote online, April 25. Directors: AGAINST Laschinger and Tastet.